The European Court of Justice has annulled the EU-Morocco trade relations because they included the territory of occupied Western Sahara. The businessman who will be most affected by that ruling turns out to be the Moroccan king. A story published yesterday in the online Morocco news agency Anayir reveals that the holding 'Les Domaines' will be most affected by the ECJ Ruling. Les Domaines is owned by the King of Morocco. The king's holding owns large plantations and greenhouses in Dakhla, all the way south in Western Sahara, also known as Africa's last colony that has been largely military occupied by Morocco since 1975. 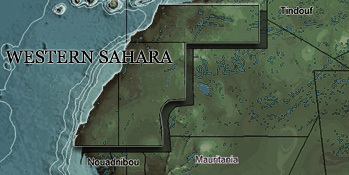 Just like in Morocco proper, the article reads, the farmable land in Dakhla is divided so that the biggest share goes to the royal holding, and the remainder is divided among other companies. In Dakhla, these are mainly French-Moroccan conglomerates. Read up on the tomato barons of Dakhla here. The king's firm, Les Domaines, is excempt from paying taxes in Morocco because it is registered as a state company. On 10 December 2015, the Court of Justice of the European Union annulled the EU-Morocco Free Trade Agreement because it was also applied to Western Sahara - a territory to which Morocco has no sovereign mandate, the Court stated. In 2012, WSRW published the report Label and Liability, going into the implications of the EU-Morocco Free Trade Agreement, looking exactly at the ownership of each plantation in Dakhla. It found that all 11 plantations are either owned by the King himself, or by large French/Moroccan companies. No Saharawis own plantations, and large settlement programmes were made to house all those Moroccan seasonal workers moving in to the territory. Yesterday's article can also be downloaded here (pdf).